As someone mentioned in the comments to today’s Leading Off, the Dallas Morning News reports that Mayor Mike Rawlings has created a new Fair Park task force, which will try to tackle one of Dallas’ tired, old challenges: what to do with Fair Park. Never mind the fact that folks like the Friends of Fair Park will corner you with a knife in a dark alley and force you to admit that millions of people showing up every year to watch Scarborough Fair-types bludgeon Celtic blades in makeshift blacksmith shops somehow constitutes vibrancy (and deny that the Fair Park Comprehensive Plan has been rendered moot by 10 years of institutional leakage). I think anyone who actually goes to the park will immediately recognize what Jim Schutze recently described as a, “dusty, cobwebby Miss Havisham’s wedding cake aura.” And then there was that whole summer amusement park idea, which surprised a whopping no one when it turned out to be big, fat failure. But this new task force sounds promising, particularly the mix of get-‘er-done types it brings to the table (though I would have liked to see a few more representatives from, you know, South Dallas). I’m sure they’re all stewing on some interesting ideas, but I’m going to make their job a lot easier. 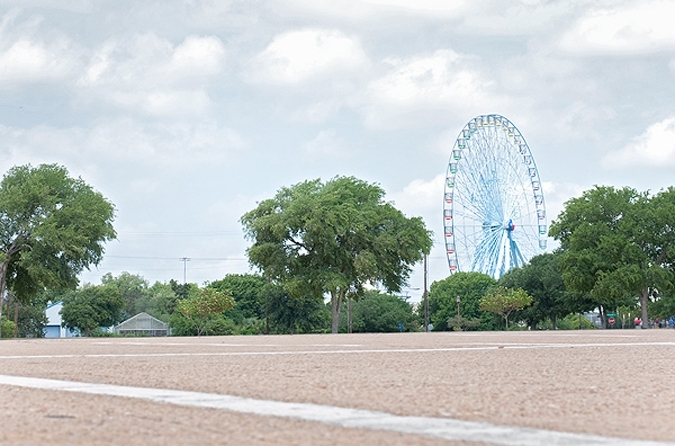 We’ve been talking about Fair Park for so long, the agenda is really already laid out. All the task force should really be doing is figuring out which goal should come first and how to muster the political will to tackle them all. FrontBurner. D Magazine, 28 Feb. 2014. Web. 10 July 2014.